Roast-turkey and cranberry and honey baked-ham with piccalilli sandwiches, stilton straws, pigs in blankets and smoked-salon roulade, followed by decadent chocolate Yule log, sticky ginger cake, clementine custard tarts, cranberry and white-chocolate fudge and creamy eggnog—Christmas afternoon tea at The Arch London features all the flavours of a festive feast, presented in the most delicate manner and washed down, of course, with a selection of teas and the obligatory scones with jam and clotted cream. The savouries were a delight in themselves and the tiny touches of edible glitter and holly leaves on the sweets elevate this to a truly luxurious treat. If you want to sample everything on offer, save the scones for last—although quite delicious, they’re not the stars of the show on this occasion and there’s more food here than you might think at first glance. Take your seats either in the warmth and glamour of the bar or in the more secluded Martini Library, where a push-button will alert the attentive and friendly staff to your every need. Tucked away just off Oxford Street, The Arch provides the perfect respite after a busy afternoon of Christmas shopping—or maybe just an opportunity to catch your breath and refuel. For added festive cheer, indulge in a glass of fizz or a house cocktail. “Hotels should be living things not stuffy institutions” – never has Kit and Tim Kemp’s own statement rung more true than in the Ham Yard hotel, part of the Firmadale chain that they own. Take your tea in the bar, restaurant or beautiful drawing room. All three are a masterclass in effortless interior style, and all three are equally easy to relax in, a must when there’s so much delicious food on offer. Savoury bites take the top spot, a welcome surprise given that the hotel’s competitors often overwhelm their menus with cakes and pastries. Miniature duck liver pate bites, crispy duck sliders and morish crab sandwiches have all made an appearance. Still hungry? There’s an add-on menu to choose from, including a portion of heartwarming truffle mac and cheese. That is not to say that those with a sweet tooth will feel left out. 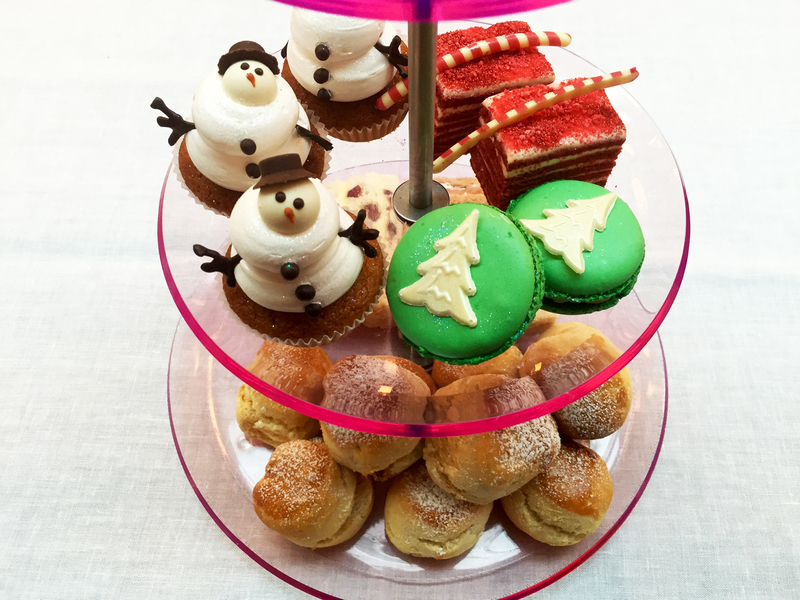 This Christmas the hotel’s kitchen has reimagined all your favourites, from macaroons to cupcakes, with a festive twist. Served in the newly restored Oscar Wilde Lounge, this grand afternoon tea spot oozes glamour. The food has a fresh take on the classic English tradition including a selection of indulgent sandwiches with fillings such as wild boar, crackling, pickled apple and mustard. 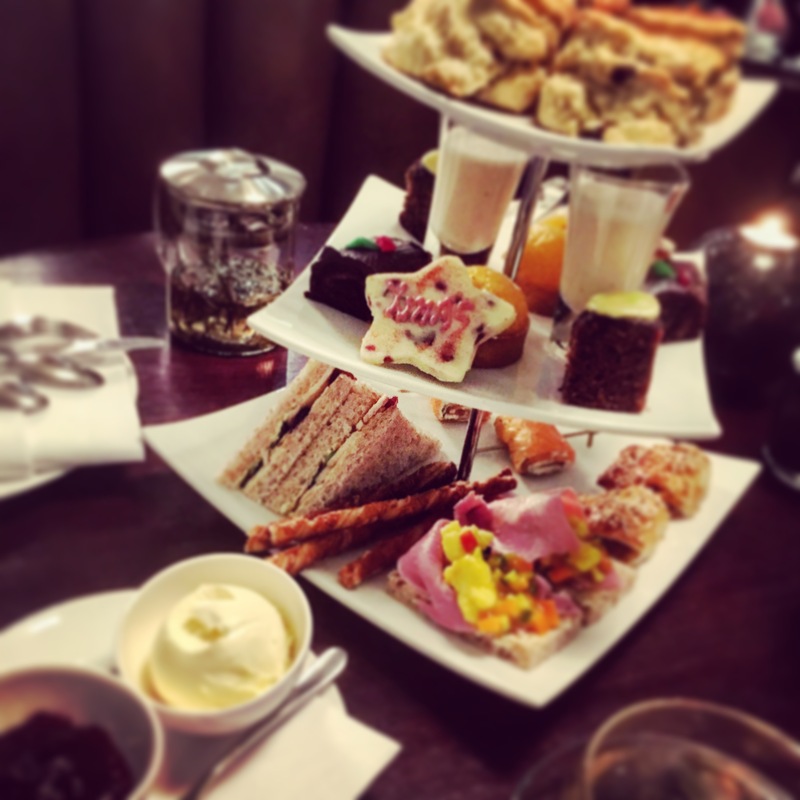 Christmas afternoon tea throughout December includes coronation turkey sandwiches, mandarin and eggnog pavlova, and Christmas cakes, alongside their extensive range of teas and champagnes. The newly refurbished Marriott Park Lane has just reopened in time to corner the market for Christmas shoppers in need of a place to collapse for the night, or as a post Winter Wonderland refuge. The restaurant, Lanes of London, has a smart causal feel and their afternoon tea has been transformed into a Christmas tea for the month of December. Try to bag seats by the window to watch the world go by – our favourites were the large high-backed armchairs forming a sort of booth which were actually in the bar – they are perfect for a private chinwag, or for cramming as much clotted cream in as possible without being seen. The Christmas tea was a joy – we were taken through the teas properly and recommended a wide range of options, including a caffeine-free black tea. The earl grey with Lavender was excellent with the sandwiches, while a white tea with the sweets was also spot on. The sandwiches are, I believe, very much their normal offering but the cakes are enormous fun, with macaron snowmen, Christmas tree brownies and stollen Christmas bread with marzipan, plus, of course the excellent scones with cream and joyfully seasonal strawberry jam. Afternoon tea is priced at £39 pp (£45 including champagne). To book, telephone +44 (0)20 493 7000 or visit http://www.marriott.co.uk/hotels/travel/lonpl-london-marriott-hotel-park-lane/.